The skin is the outermost part of our body and plays a defensive role against various external environments including ultraviolet (UV) rays. Skin aging is manifested by wrinkles, decreased elasticity, and pigmentation. There are two major causes of skin aging that can cause wrinkles. Intrinsic aging naturally occurs as people age, which means hormone secretion decreases, cell activity decreases, and the skin wrinkles due to the decrease of biosynthesis of constitutive proteins caused by mutation and cell metabolism imbalance. The occurrence of exogenous aging means the occurrence of skin wrinkles caused by environmental factors such as UV rays, gravity, and polluted air,. The occurrence of wrinkles is caused by the deformation of the dermal tissue of the skin. The dermis is the connective tissue underlying in the epidermis and occupies most of the skin volume. It is not densely packed like the epidermal keratinocyte, and has many extracellular spaces. It is composed of extracellular matrix and fibroblast, which is a macromolecular network. Fibroblast is responsible for the expression of collagen and elastin, which are fibrous proteins, and helps maintaining the flexibility, elasticity and tension of the skin. When the action of fibroblasts that produce extracellular matrix is degraded by UV, collagen biosynthesis is decreased and degenerated elastin is increased. Furthermore, the expression of matrix metalloproteinases (MMPs), a metalloprotease that degrades extracellular matrix, has been shown to result in deformation of cells and extracellular matrix, causing damage to the length and distribution of collagen fibers. The epidermis-dermal boundary is destroyed, harmful components are introduced and dermal decomposition is accelerated. The skin always comes into contact with oxygen and is constantly exposed to UV resulting in skin protein denaturation and cell damage caused by reactive oxidant species (ROS). As the intracellular ROS increases, it promotes intracellular oxidative damage and degrades the enzymatic function of the antioxidant enzyme, thereby impairing the skin defense system against the aging of the skin and the external harmful environment,. The flower bud of Syzygium aromaticum L. (S. aromaticum L.) has a strong unusual smell. Its flavor is spicy and it is not toxic. S. aromaticum L. was considered as a cure for diarrhea, most liver, stomach and bowel ailments, and as a stimulant for the nerves for centuries. Traditionally S. aromaticum L. has been used to treat flatulence, nausea and vomiting. In foods and drinks, S. aromaticum L. is used as a flavoring. In manufacturing, S. aromaticum L. is used in toothpaste, soaps, cosmetics and perfumes. Studies on S. aromaticum L. have been conducted on antioxidant, antimicrobial, antiviral, anticoagulant, immediate hypersensitivity suppression, antiallergic, vasodilation, and anesthetic effects,,,,. In order to improve skin wrinkles and prevent aging, it is important to find antioxidants that remove active oxygen, materials that increase collagen synthesis, or inhibit MMPs, enzymes that degrade extracellular matrix. We hypothesized that S. aromaticum L. could be beneficial to skin wrinkles based on antioxidant properties. However, there are only a few studies on the improvement of wrinkles using S. aromaticum L.. Therefore, in this paper, we planned to confirm the wrinkle-improving activity and underlying mechanisms of S. aromaticum L.
Reagents used were of analytical grade purchased from suppliers such as Sigma-Aldrich (St. Louis, MO, USA), 3-(4,5-dimethylthiazol-2-yl)-2,5-diphenyltetrazolium bromide (MTT), dimethyl sulfoxide, 2,2-diphenyl-1-picrylhydrazyl (DPPH), N-succinyl-(L-Ala)-3-p-nitroanilide and elastase. Dulbecco modified eagle medium, penicillin/streptomycin, phosphate-buffered saline and fetal bovine serum were obtained from Life Technologies Corporation. Tumor necrosis factor alpha (TNF- α) was obtained from R&D Systems Inc. (MN, USA). Easy-Blue™ Total RNA extraction kit was purchased from Intron Biotechnology, Inc. (iNtRON Biotechnology, Seongnam, Korea). Superoxide dismutase (SOD) Assay Kit-WST was purchased from Dojindo Laboratories (Kumamoto, Japan). MMP-1 Biotrack activity Assay Kit was purchased from Amersham Bioscience (Amersham, UK) and a procollagen type-I C peptide (PIP) EIA kit was purchased from Takara Bio Inc. (Takara bio, Tokyo, Japan). TaqManRNA-to-CtTM 1-Step Kits were purchased from Applied Biosystems (USA). 2.2. Extract of S. aromaticum L.
S. aromaticum L. were purchased through Heungil Pharmaceuticals (Korea) and extracted by the Hanpoong Pharm and Foods Company (Korea). S. aromaticum L. (1 kg) were boiled with 1 L of 50% ethanol for 3 h. The extract was filtered with a 1 μm filter, and the residue was subjected to secondary extraction under the same conditions. 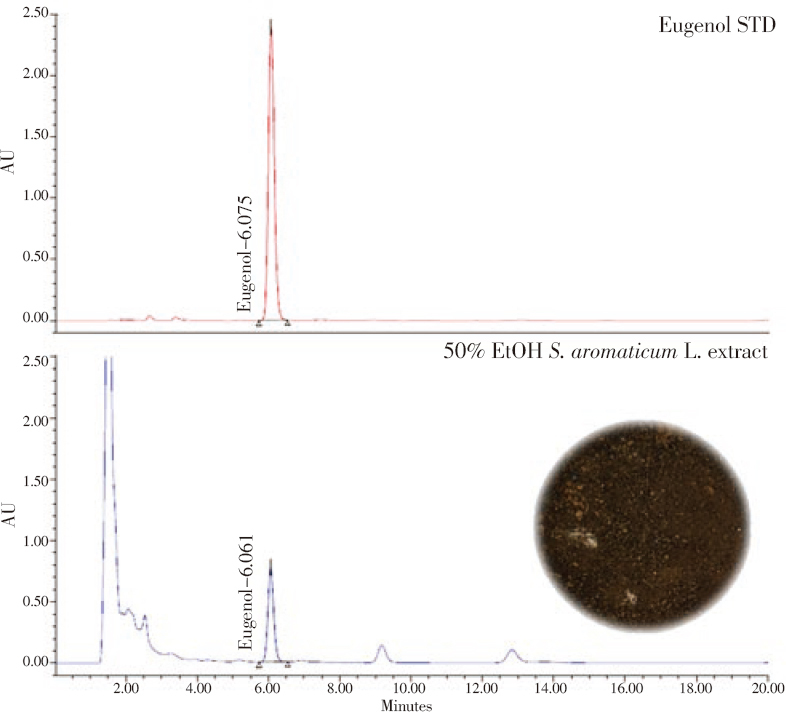 The solvent was independently evaporated under reduced pressure at 60 °C, and the extract was completely dried to obtain a S. aromaticum L. extract (SAE). The percentage yield of the dry SAE was found to be 18.5%. The eugenol content of SAE was determined by HPLC. HPLC analyses were performed on a Waters 2695 HPLC system (Milford, USA) equipped with 250 mm χ 4.6 mm Capcellpak UG-120 ODS column (Shiseido, Japan). The mobile phase consisted of (A) methanol/water/acetic acid (10:88:2, v/v/v) and (B) methanol/water/ acetic acid (98:2:2, v/v/v). The flow rate was set at 1 mL/min, peaks were acquired at 260 nm. The presence of eugenol was confirmed by comparing the peak of the standard eugenol (Sigma-Aldrich, USA) and the residence time. The DPPH radical scavenging assay was conducted according to the method described by Manivasagan et al..
A total of 0.1 mL SAE (0, 10, 50, 100 and 500 μg/mL) samples were added to 0.1 mM DPPH dissolved in methanol (0.1 mL) solution and mixed thoroughly. After incubation for 30 min in the dark at room temperature, the absorbance was measured at 520 nm. Vitamin C was used as a positive control. SOD activity of SAE was evaluated on 96-well plates using a SOD Assay Kit-WST (Dojindo Molecular Technologies, Japan) following the procedure provided by the supplier. Briefly, 20 μL of a sample solution and 200 μL of water-soluble tetrazolium salt working solution were mixed in the well. The reaction was initiated by the addition of 20 μL of enzyme working solution and the plate was incubated at 37 °C for 20 min. The absorbance was measured at 450 nm using a microplate reader (BioTek, VT, USA). Trolox was used as a positive control. The inhibition of elastase activity was evaluated by the hydrolysis of N-succinyl-(L-Ala)3-p-nitroanilide under the specified conditions (at 25 °C and pH 8.0). The reaction mixture contained 0.2 M Tris-HCl buffer (pH 8.0), SAE samples (50, 100 and 500 μg/mL) or 500 μg/mL ursolic acid, 1 unit/mL elastase, and 1 mM N-succinyl-(L-Ala)3-p-nitroanilide. The reaction mixture was incubated for 20 min at 25 °C, and absorbance was measured at 405 nm. HS68 human fibroblast cell lines were purchased from ATCC (Manassas, VA, USA). Dulbecco modified eagle medium used for cell culture was mixed with 10% fetal bovine serum and 1% penicillin/ streptomycin. Cell incubation was performed in a 5% CO2 incubator at 37 °C. The cell viability was assessed using an MTT assay. HS68 cells were seeded in a 96-well plate at a density of 3 × 104 cells/ well and treated with various concentrations of SAE (0, 10, 25, 50, 100 and 200 μg/mL) for 24 h. MTT media at 1 mg/mL were added into each well and incubated for 3 h at 37 °C. The MTT formazan precipitate was then dissolved in 200 μL of dimethyl sulfoxide, and the absorbance was measured at 540 nm. To examine inhibitory effects of SAE on MMP-1 activity, HS68 human fibroblast cells were cultured with SAE or adenosine for 24 h and then the supernatants were collected to quantify the level of MMP-1. SAE were treated at 25, 50, and 100 μg/mL concentrations and simultaneously treated with TNF- α (10 ng/mL) to induce MMP-1 expression. MMP-1 activity was measured with an MMP-1 Human Biotrak ELISA System (Amersham Biosciences Corp, NJ). Activity assays were performed according to the manufacturer's instructions and the absorbance was measured at 450 nm (BioTek, VT, USA). The mRNA was isolated with the easy-Blue Total RNA extraction kit. The concentration of RNA was determined using the ND-1000 Spectrophotometer (NanoDrop Technologies, DE). Total RNA was used in the existence of the TaqMan® RNA-to-CTTM 1-Step Kit (Applied Biosystems) according to the manufacturer's instructions. Analysis of relative gene expression was based on the ΔCt method. Data were expressed as mean ± SD. Significant differences were compared using one-way ANOVA followed by the Tukey multiple range test. Statistical significance was defined as P< 0.05. All statistical analyses were performed using GraphPad Software. Eugenol content of SAE quantitated by HPLC was found to be 37 mg/g. The chromatogram of eugenol was shown in [Figure 1]. Figure 1: HPLC of eugenol in SAE at 260 nm. To determine the antioxidant effect of SAE, DPPH and superoxide radical scavenging activities of SAE were measured. The DPPH radical scavenging activities at 10 and 50 μg/mL were 51.0% and 95.3%, respecitvely (IC50= 16.1 μg/mL). DPPH scavenging activity of 50 μM vitamin C (a positive control) was 65.8% [Figure 2]a. The superoxide radical scavenging activities of SAE at 10, 50 and 100 μg/mL were 35.8%, 77.6% and 90.3% respectively (IC50= 23.6 μg/mL), while that of 500 μM trolox (a positive control) was 58.4% [Figure 2]b. Antioxidant activity of SAE was displayed in a dose-dependent manner. Figure 2: Anti-oxidant activities of SAE determined by (a) DPPH radical scavenging activity and (b) superoxide radical scavenging activity. Vitamin C and trolox were used as positive controls, respectively. The results were presented as mean ± SD. Values with different letters (a, b, c, d) indicated significant difference one from another (one-way ANOVA followed by Tukey multiple range test, P < 0.05). The elastase inhibitory activity of SAE was shown in [Figure 3]. 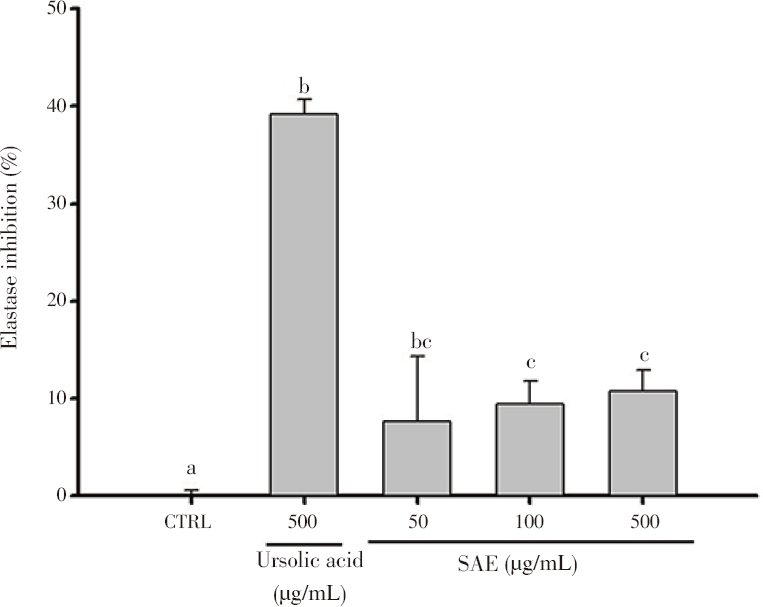 The elastase activities of SAE at 100 and 500 μg/mL were 9.5% and 10.8% each, while that of 500 μg/mL ursolic acid (a positive control) was 39.1% [Figure 3]. The ability of SAE to inhibit elastase activity dose dependently has been observed, and it has shown significant effects. Figure 3: Inhibitory effects of SAE on elastase. Elastase activity was assessed by measuring the absorbance at 405 nm. Ursolic acid was used as a positive control. The results were presented as mean ± SD. Values with different letters (a, b, c) indicated significant difference one from another (one-way ANOVA followed by Tukey multiple range test, P < 0.05). The cells were treated with various concentrations (0, 10, 25, 50, 100 and 200 μg/mL) of SAE for 24 h. SAE did not induce any significant cytotoxicity up to 200 μg/mL concentration. Therefore, SAE did not show any effects on cell proliferation [Figure 4]a. Figure 4: Effect of SAE on (a) cell viability and (b) MMP-1 content in HS68 human fibroblast cells. The HS68 cells were treated with various concentrations of SAE, and TNF- α (10 ng/mL) was treated for MMP-1 activation except control group. The results were presented as mean ± SD. Values with different letters (a, b, c, d) were significantly different one from another (one-way ANOVA followed by Tukey multiple range test, P < 0.05). As a result, it was confirmed that the vehicle group and the TNF- α treated group produced 2.0 ng/mL and 60.4 ng/mL of MMP-1, respectively, and the amount of MMP-1 induced by TNF- α increased. MMP-1 inhibition rates of SAE were 55.3%, 76.3% and 85.0% at 25, 50 and 100 μg/mL, respectively (IC50=24.9 μg/mL), when compared with the TNF- α treatment group [Figure 4]b. To determine whether SAE modulates skin aging-related factors at the molecular level, MMP-1, MMP-2, MMP-3 and MMP-9 mRNA levels were examined. The expressions of MMP-1, MMP-2, MMP-3, and MMP-9 increased after being treated with 10 ng/mL of TNF- α. The inhibition rates of MMP-1 expression by SAE were 59.7%, 79.6% and 80.7% at 25, 50 and 100 μg/mL respectively, when compared with the TNF- α treatment group. Inhibition rates of MMP-2 expression at 25, 50 and 100 μg/mL were 24.5%, 34.4% and 52.0%, respectively. Moreover, MMP-3 expression inhibition rates were 36.6%, 64.5% and 74.7% while MMP-9 expression inhibition rates were 57.4%, 86.6% and 93.7% at 25, 50 and 100 μg/mL, respectively [Figure 5]. Figure 5: Effects of SAE on mRNA expressions of (a) MMP-1, (b) MMP-2, (c) MMP-3 and (d) MMP-9. HS68 cells were stimulated with TNF- α (10 ng/mL) and incubated with SAE. GAPDH was used as an internal standard. The results were presented as mean ± SD. Values with different letters (a, b, c, d) were significantly different one from another (one-way ANOVA followed by Tukey multiple range test, P < 0.05). The skin consists of three layers, from the outside to the epidermis, dermis and subcutaneous fat layer. The dermis is located between the epidermis and the fat layer, and consists of matrix and connective tissue composed of fiber protein such as collagen and elastin,. Collagen gives strength and tension to the skin, protects the skin, occupies more than 90% of the dermis, and 80% of the extracellular matrix. Collagen is composed of 80%-85% type-I collagen and 15%-20% type-III collagen and fibronectin. Elastin accounts for about 3%-4% of the extracellular matrix and maintains the elasticity of the skin,. Skin aging reduces the synthesis of collagen and elastin in the dermal fibroblast, collagen degradation by MMPs increases, the elasticity reduces, and wrinkles are generated. In addition, reduced collagen in skin that is continuously exposed to ROS and UVB is also an important cause of wrinkle formation. To maintain the normal state of the human body, restraint of homeostasis and excessive stress is important. Antioxidant systems which protect the tissue cells from oxidative damage of lipid, protein and nucleic acid play a critical role. These antioxidant systems are classified into two types, antioxidant enzymes and non-enzymatic antioxidants. Especially, catalase and SOD are typical examples of enzymatic defense mechanisms,. DPPH radical scavenging ability and SOD-like activity, which can predict the inhibition of the initial reaction of lipid peroxidation, were measured in order to examine the antioxidant activity of SAE. The antioxidative effect of SAE showed a concentration-dependent increase which was higher than positive controls in experimental conditions. Several constituents of S. aromaticum L. have been identified, mainly eugenol, eugenol acetate, vanillin, eugenin, rhamnetin, kaempferol, α -humulene, β -caryophyllene, biflorin and caryophyllene,. Also some flavonoids including kaempferol, rhamnetin and β -caryophyllene were reported to have the anti-inflammatory and antibacterial activity,. Antioxidant activity of S. aromaticum L. might be due to the higher concentration of phenolic compounds such as eugenol, eugenol acetate, β -caryophyllene and thymol,. A strong antioxidant effect of SAE is expected to protect the skin cells and maximize the wrinkle improvement effect. Decreased elastin causes wrinkles and loss of elasticity as well as promotes skin aging. Elastase decomposes the elastin of the stratum corneum, reducing the elasticity of the skin and causing the skin to age. Elastase is a protease corresponding to MMP-12 in MMPs and acts specifically on the degradation of elastin. Substances that inhibit elastase activity have the effect of improving skin wrinkles. The elastase inhibitory activity of SAE was lower than that of the positive control, but it still showed significant inhibitory activity. Collagen is a major substrate protein produced in the fibroblasts of the skin and serves to protect the body from external physiological and chemical stimulation. As aging progresses, collagen production decreases and degradation increases, thus inducing depression of the dermal layer of the skin to produce wrinkles. Procollagen contains a peptide sequence called propeptide at the amino terminus and carboxyl terminus. It is known to help the folding of procollagen molecules in the endoplasmic reticulum and to cleave and separate from the collagen molecules when the collagen polymerization takes place. Therefore, by measuring the amount of the separated propeptide, the degree of collagen biosynthesis in the cell can be determined. Procollagen biosynthesis of SAE did not promote collagen synthesis (data not shown). The type I collagen occupies 80% of the total collagen. In normal skin, the synthesis of type I collagen and its degrading enzyme, MMP-1, are balanced to maintain the elasticity of the skin. MMP-1 activity reduces collagen degradation, maintains elasticity of skin tissue and prevents wrinkle formation. The amount of MMP-1 was confirmed by the treatment of SAE in fibroblast. As a result, the inhibitory effect of 55.3% and the significant difference were confirmed at 25 μg/mL used in the experiment. MMPs are endopeptidases that require zinc ions to participate in the degradation of all the intracellular matrix's components. These MMPs are classified into 5 types according to their substrate specificity. MMP-1 is collagenase 1, which is involved in various body processes such as cell or tissue growth. MMP-3 is stromelysin 1, which degrades type IV collagen of basement membrane and activates pro-MMP-1, a zymogen. 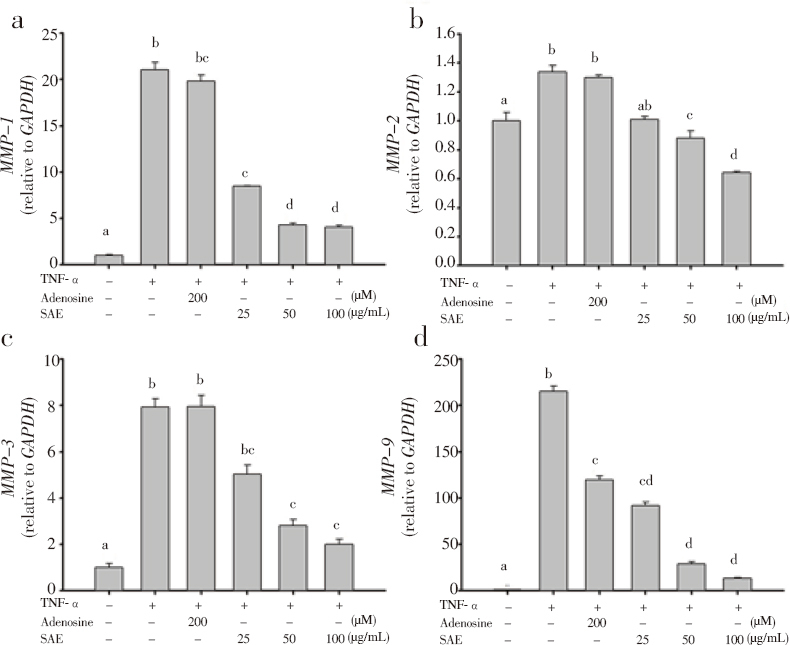 MMP-9 is gelatinase B, which hydrolyses products degraded by collagenase to a smaller extent,,. This study found that mRNA expressions of MMP-1, MMP-2, MMP-3, and MMP-9 by SAE treatment were inhibited in a concentration-dependent manner. This study also confirmed the antioxidant and wrinkle-improving effects of S. aromaticum L. Antioxidant activity, cell viability, elastase inhibitory activity, MMP-1 level and mRNA expressions of MMPs (MMP-1, MMP-2, MMP-3, MMP-9) were investigated in SAE. The antioxidant activity of SAE was confirmed by measuring DPPH and SOD-like activities. As a result, it increased in a concentration-dependent manner and showed a high antioxidative effect compared with the positive controls. SAE did not show any cytotoxicity of the cells at all concentrations tested. SAE significantly decreased the amount of MMP-1 induced by TNF- α treatment, confirming the MMP-1 inhibitory effect. Elastase inhibition activity of SAE also showed significant results. Besides, MMPs mRNA expressions were inhibited by SAE treatment. These results suggest that the effect of improving wrinkles of SAE is due to the strong antioxidant effect and the inhibition of elastase and MMPs. Therefore, SAE can be considered to be highly useful as a wrinkle improving material. The authors declare that there are no conflicts of interests regarding the publication of this article. Park GSY, Lee W, Sung SH, Oh MS. Protection on skin aging mediated by antiapoptosis effects of the water lily (Nymphaea tetragona Georgi) via reactive oxygen species scavenging in human epidermal keratinocytes. Pharmacology 2016; 97(5-6): 282-293. Farage MA, Miller KW, Elsner P, Maibach HI. Intrinsic and extrinsic factors in skin ageing: A review. Int J Cosmet Sci 2008; 30(2): 87-95. Bertuccelli G, Zerbinati N, Marcellino M, Nanda Kumar NS, He F, Tsepakolenko V, et al. Effect of a quality-controlled fermented nutraceutical on skin aging markers: An antioxidant-control, double-blind study. Exp Ther Med 2016; 11(3): 909-916. Fisher GJ, Quan T, Purohit T, Shao Y, Cho MK, He T, et al. Collagen fragmentation promotes oxidative stress and elevates matrix metalloproteinase-1 in fibroblasts in aged human skin. Am J Pathol 2009; 174(1): 101-114. Pittayapruek P, Meephansan J, Prapapan O, Komine M, Ohtsuki M. Role of matrix metalloproteinases in photoaging and photocarcinogenesis. Int J Mol Sci 2016; 17(6): 868. Hideg E, Jansen MA, Strid A. UV-B exposure, ROS, and stress: Inseparable companions or loosely linked associates? Trends Plant Sci 2013; 18(2): 107-115. Zhu X, Li N, Wang Y, Ding L, Chen H, Yu Y, et al. Protective effects of quercetin on UVB irradiation-induced cytotoxicity through ROS clearance in keratinocyte cells. Oncol Rep 2017; 37(1): 209-218. Cai L, Wu CD. Compounds from Syzygium aromaticum possessing growth inhibitory activity against oral pathogens. J Nat Prod 1996; 59(10): 987-990. Dorman HJ, Deans SG. Antimicrobial agents from plants: Antibacterial activity of plant volatile oils. J Appl Microbiol 2000; 88(2): 308-316. Jirovetz L, Buchbauer G, Stoilova I, Stoyanova A, Krastanov A, Schmidt E. Chemical composition and antioxidant properties of clove leaf essential oil. J Agric Food Chem 2006; 54(17): 6303-6307. Lee KG, Shibamoto T. Inhibition of malonaldehyde formation from blood plasma oxidation by aroma extracts and aroma components isolated from clove and eucalyptus. Food Chem Toxicol 2001; 39(12): 1199-1204. Tajuddin, Ahmad S, Latif A, Qasmi IA. Effect of 50% ethanolic extract of Syzygium aromaticum (L.) Merr. & Perry. (clove) on sexual behaviour of normal male rats. BMC Complement Altern Med 2004; 4: 17. Rodrigues TG, Fernandes A Jr, Sousa JP, Bastos JK, Sforcin JM. In vitro and in vivo effects of clove on pro-inflammatory cytokines production by macrophages. Nat Prod Res 2009; 23(4): 319-326. Adefegha SA, Oboh G. In vitro inhibition activity of polyphenol-rich extracts from Syzygium aromaticum (L.) Merr. & Perry (Clove) buds against carbohydrate hydrolyzing enzymes linked to type 2 diabetes and Fe(2+)-induced lipid peroxidation in rat pancreas. Asian Pac J Trop Biomed 2012; 2(10): 774-781. Chang BY, Lee DS, Lee JK, Kim YC, Cho HK, Kim SY. Protective activity of kudzu (Pueraria thunbergiana) vine on chemically-induced hepatotoxicity: In vitro and in vivo studies. BMC Complement Altern Med 2016; 16(1): 39. Manivasagan P, Alam MS, Kang KH, Kwak M, Kim SK. Extracellular synthesis of gold bionanoparticles by Nocardiopsis sp. and evaluation of its antimicrobial, antioxidant and cytotoxic activities. Bioprocess Biosyst Eng 2015; 38(6): 1167-1177. Ishii Y, Sugimoto S, Izawa N, Sone T, Chiba K, Miyazaki K. Oral administration of Bifidobacterium breve attenuates UV-induced barrier perturbation and oxidative stress in hairless mice skin. Arch Dermatol Res 2014; 306(5): 467-473. Stergiou PY, Foukis A, Gkini OA, Bieth JG, Papamichael EM. Kinetic and computational analysis of the reversible inhibition of porcine pancreatic elastase: A structural and mechanistic approach. J Enzyme Inhib Med Chem 2016; 31(3): 131-139. Liao KH, Lin YS, Macosko CW, Haynes CL. Cytotoxicity of graphene oxide and graphene in human erythrocytes and skin fibroblasts. ACS Appl Mater Interfaces 2011; 3(7): 2607-2615. Amato B, Coretti G, Compagna R, Amato M, Buffone G, Gigliotti D, et al. Role of matrix metalloproteinases in non-healing venous ulcers. Int Wound J 2015; 12(6): 641-645. Wilmink GJ, Roth CL, Ibey BL, Ketchum N, Bernhard J, Cerna CZ, et al. Identification of microRNAs associated with hyperthermia-induced cellular stress response. Cell Stress Chaperones 2010; 15(6): 1027-1038. Mohammadi MH, Heidary Araghi B, Beydaghi V, Geraili A, Moradi F, Jafari P, et al. Skin diseases modeling using combined tissue engineering and microfluidic technologies. Adv Healthc Mater 2016; 5(19): 2459-2480. Tracy LE, Minasian RA, Caterson EJ. Extracellular matrix and dermal fibroblast function in the healing wound. Adv Wound Care (New Rochelle) 2016; 5(3): 119-136. Saldin LT, Cramer MC, Velankar SS, White LJ, Badylak SF. Extracellular matrix hydrogels from decellularized tissues: Structure and function. Acta Biomaterialia 2017; 49: 1-15. Kang TH, Park HM, Kim YB, Kim H, Kim N, Do JH, et al. Effects of red ginseng extract on UVB irradiation-induced skin aging in hairless mice. J Ethnopharmacol 2009; 123(3): 446-451. Kim DB, Shin GH, Kim JM, Kim YH, Lee JH, Lee JS, et al. Antioxidant and anti-ageing activities of citrus-based juice mixture. Food Chem 2016; 194: 920-927. Gill SS, Tuteja N. Reactive oxygen species and antioxidant machinery in abiotic stress tolerance in crop plants. Plant Physiol Biochem 2010; 48(12): 909-930. Wang L, Ding L, Yu Z, Zhang T, Ma S, Liu J. Intracellular ROS scavenging and antioxidant enzyme regulating capacities of corn gluten meal-derived antioxidant peptides in HepG2 cells. Food Res Int 2016; 90: 33-41. Razafimamonjison G, Jahiel M, Duclos T, Ramanoelina P, Fawbush F, Danthu P. Bud, leaf and stem essential oil composition of Syzygium aromaticum from Madagascar, Indonesia and Zanzibar. Int J Basic Appl Sci 2014; 3(3): 224-233. Santoro GF, Cardoso MG, Guimarães LG, Mendonça LZ, Soares MJ. Trypanosoma cruzi: Activity of essential oils from Achillea millefolium L., Syzygium aromaticum L. and Ocimum basilicum L. on epimastigotes and trypomastigotes. Exp Parasitol 2007; 116(3): 283-290. Ajiboye TO, Mohammed AO, Bello SA, Yusuf II, Ibitoye OB, Muritala HF, et al. Antibacterial activity of Syzygium aromaticum seed: Studies on oxidative stress biomarkers and membrane permeability. Microb Pathog 2016; 95: 208-215. Saikumari D, Rani SKS, Saxena N. Antibacterial activity of Syzigium aromaticum L. (Clove). Int J Curr Microbiol Appl Sci 2016; 5(11): 6. Mittal M, Gupta N, Parashar P, Mehra V, Khatri M. Phytochemical evaluation and pharmacological activity of Syzygium aromaticum: A comprehensive review. Int J Pharm Pharmaceut Sci 2014; 6(8): 67-72. Chaieb K, Hajlaoui H, Zmantar T, Kahla-Nakbi AB, Rouabhia M, Mahdouani K, et al. The chemical composition and biological activity of clove essential oil, Eugenia caryophyllata (Syzigium aromaticum L. Myrtaceae): A short review. Phytother Res 2007; 21(6): 501-506. Aziz J, Shezali H, Radzi Z, Yahya NA, Abu Kassim NH, Czernuszka J, et al. Molecular mechanisms of stress-responsive changes in collagen and elastin networks in skin. Skin Pharmacol Physiol 2016; 29(4): 190-203. Chung JH, Seo JY, Choi HR, Lee MK, Youn CS, Rhie G, et al. Modulation of skin collagen metabolism in aged and photoaged human skin in vivo. J Invest Dermatol 2001; 117(5): 1218-1224. Fujiwara M, Muragaki Y, Ooshima A. Keloid-derived fibroblasts show increased secretion of factors involved in collagen turnover and depend on matrix metalloproteinase for migration. Br J Dermatol 2005; 153(2): 295-300. Roh E, Kim JE, Kwon JY, Park JS, Bode AM, Dong Z, et al. Molecular mechanisms of green tea polyphenols with protective effects against skin photoaging. Crit Rev Food Sci Nutr 2017; 57(8): 1631-1637. Sela-Passwell N, Rosenblum G, Shoham T, Sagi I. Structural and functional bases for allosteric control of MMP activities: Can it pave the path for selective inhibition? Biochim Biophys Acta 2010; 1803(1): 29-38. Kim J, Kim MB, Yun JG, Hwang JK. Protective effects of standardized Siegesbeckia glabrescens extract and its active compound kirenol against UVB-induced photoaging through inhibition of MAPK/NF-κB pathways. J Microbiol Biotechnol 2017; 27(2): 242-250. Jabłońska-Trypuć A, Matejczyk M, Rosochacki S. Matrix metalloproteinases (MMPs), the main extracellular matrix (ECM) enzymes in collagen degradation, as a target for anticancer drugs. J Enzyme Inhib Med Chem 2016; 31 (sup1): 177-183.